Loc-Line flexible modular hose offers endless plumbing configurations and is useful for unique plumbing designs. Loc- Line Modular plumbing is most commonly used on return lines and closed loops where it is important to direct the water flow in a particular direction. I found them hard to snap together and did not want to purchase tool to help snap them together for one time use. I did eventually get them together on the ground, after that I put them in the tank. I am also short with a deep tank. Glad to have these to match to my PVC plumbing. It sure did make it easy! It is exactly what they say it is, Loc-Line on the front line, for your return line. 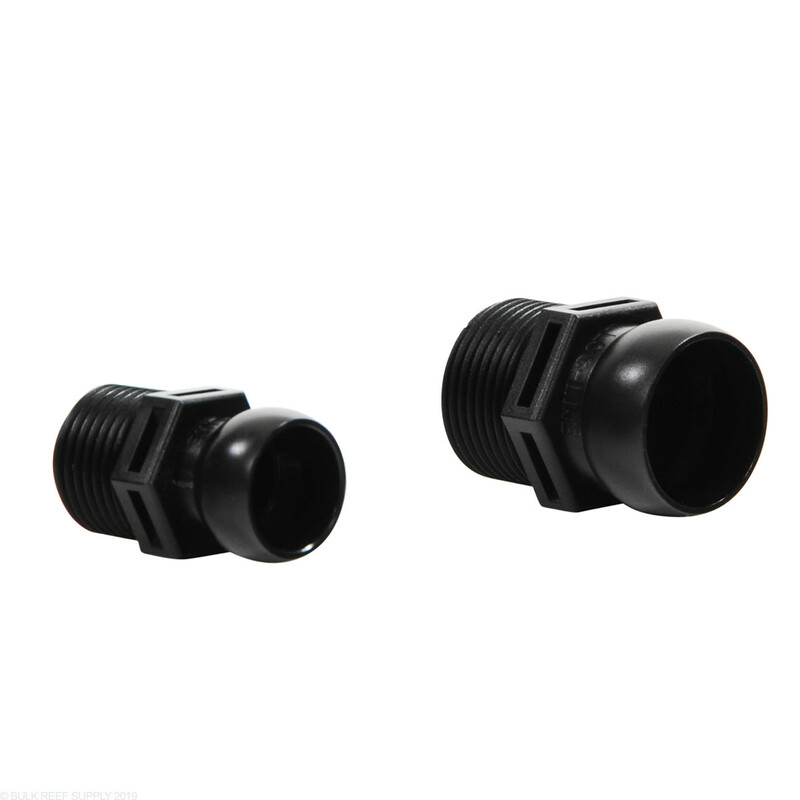 No time to waste, order with haste, If you need this connector, then you better not sweat her. She knows where your money goes, saltwater for life! This is a great item. Does what it says. I recommend it. Since I found the Loc-Line products here at Buik Reef I won't use anything else. Great Product! just pop it in after warm water. Good product. I purchased two of these 1/2 for my sump returns. I was installing them with the wye connector and as I was screwing them into my pvc return, I broke on right off at the threads. I now need to purchase a second one and there is no-one that has them local, so now I need to purchase a single unit for ~2.00 and ship it out. Spend the extra 2 bucks up front and purchase an extra one. You will also need the snap together tool. Screws in great to 3/4 inch bulkheads. Works great. Are the threads on these the same as on the threaded bulkheads? Yes, the bulkheads and all of our plumbing parts with threads are all NPT standard and will fit together. I have a 1" bulkhead and dont know how I would transition to the 3/4" NPT and the 3/4" lock line. You will need a 1" to 3/4" reducing bushing to put into your bulkhead, and then the 3/4" NPT adapter for loc-line. That will then screw into the 3/4" bushing and you can attach more loc-line segments as needed onto the adapter. All npt fittings are designed to work with the corresponding pvc size. If you are using a 1" bulkhead, you'll want to get a 1" to 3/4" reducing bushing to be able to use the 3/4" npt loc line adapter. Hello, I wanted to know what size bulkhead should i use, i have the 3/4" NPT connector? Also what size diamond bit should i purchase to make the hole for the bulkhead? Idea for you guys maybe make a bit+bulkhead+NPT connector starter kit.. Just a thought, it would buy it. If you want to use the 3/4" NPT loc-line adapter then your best bet would be to use a 3/4" threaded bulkhead. That way you don't need any adapters, etc. Which size drill bit depends on which type of bulkheads. (abs vs sch80) but assuming your typical ABS 3/4" bulkhead your looking at a 35mm drill bit. Which side of the Loc-Line is 3/4? Does it screw into a 3/4 fitting? 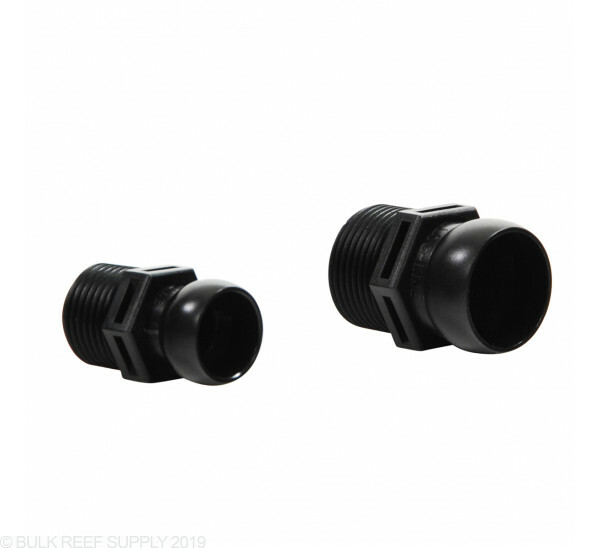 In order to connect the loc-line to a bulkhead or other plumbing you will need Loc-Line Male NPT Connector, found here: https://www.bulkreefsupply.com/loc-line-male-npt-connector.html. The 3/4" npt connector will fit 3/4" plumbing/bulkheads. What is the thread size on this product? It depends on which fitting you purchase. If your purchase the 1/2" version then it will have 1/2" NPT threads and if you purchase the 3/4" version it will have 3/4" NPT threads.